When you install Windows 10, Windows asks for creating a username and password which is used to login as administrator in Windows 10. This may be the main account for logging in to Windows but it is not the actual administrator account. 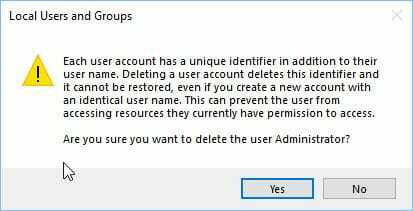 The super-administrator account is disabled by default in Windows 10 for security reasons. The difference between a built-in administrator account and the one you are using is that the built-in admin account does not get UAC prompts for running applications in administrative mode. In this article, we will discuss about enabling the hidden administrator account in Windows 10. The same also applies to Windows 8, Windows 8.1 and Windows 7. 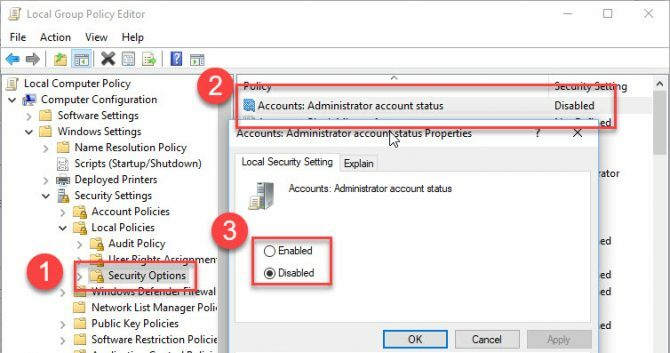 There are quite a few ways to enable the hidden administrator account in Windows 10. Let’s discuss them one by one. You can use any method which is comfortable for you. Don’t forget to password protect the Administrator account by setting a new password. By default, the administrator account will have no password. After enabling the administrator user, you will see the user on the login screen. Just click on the administrator username and enter the password to login as administrator in your Windows 10 computer. After enabling the administrator user, log off from your current account and you will see the Administrator user visible on the login screen. Click on it and login using the password you just set. In the right-hand pane, open “Accounts: Administrator account status. This is disabled by default. Enable to setting to enable the administrator account. Go to Users and select New user from Actions menu. Once the user is created, double-click the username to open account Properties. Go to Member Of tab, click the Add button. Type administrator in the object name field and press Check Names button. Double-click the username from the list of local users to open account Properties. Right-click the user you want to delete and select Delete. Press Yes to delete the user immediately. 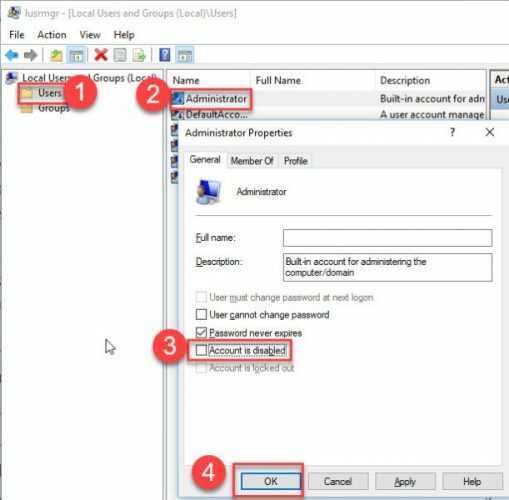 Although it is not recommended to enable and login as administrator in Windows, if it is a requirement, you can always use any of the methods given in this article to enable and use administrator account. Just handle the super admin account with care. I have the same problem. I was trying to delete an app, which was not allowed as only by administrator. I went to “settings” page and then accounts section, then checked my user group administrator status. I made the mistake of changing that to user only. Then cannot change back. Yet, app management was not allowed even before I did that. On chat with Microsoft, went in circles there that ended up to “Reset Windows 10.” Geesh. After you reset your system does everything seems ok? My issue is clearly way deeper in the system. This Snapin can’t be used with this edition of Win 10, Go to user accounts in Cont Panel – where there is no appropriate heading. The dreaded ‘NO’ box accompanied by the windows (you loose) ‘bongs’! To continue, enter an admin user name and password. This means that I can’t even allow the JAVA update which has been ‘nagging’ for some days – as I have no authority what so ever over MY computer! I’ve spent 20+ hours chasing this which included contact with Microsoft who did a re-install (without actually asking). Fortunately I had backed up all my personal files before contacting them! The only noticeable effect being that I then possessed a US configured keyboard!!! @ and ” swap places but don’t tell you so you begin ‘hunt the needle Microsoft version’! This little trick (illogically) requires a visit to Time & Language in Settings to rectify. Linux continues to look better and better! I have tried may other suggestions and am beginning to consider a full WIN 10 re-install. This clearly something buried much deeper that I can find. I’m also having the same problem. iTechtics is a technology blog focusing on Windows news, software and downloads, Software tips and tricks, Web services, Security and Office productivity. © 2013 – 2019 iTechtics Technology Blog. All Rights Reserved.